Starting on Friday 5 April, the season’s opener will see the 2005 and 2010 champions play host to the Club that secured the trophy in 2014 and 2015. Nottinghamshire will then welcome Somerset starting on Thursday 11 April, prior to a block of Royal London One-Day Cup action with the eight-match group stage to be completed in the space of 15 days. The winner of the Royal London One-Day Cup will be crowned at Lord’s at the earlier than usual date of Saturday 25 May. And with the ICC Cricket World Cup taking over a number of venues for long periods, out-ground cricket continues to feature in Nottinghamshire’s schedule. The away Specsavers County Championship match against Hampshire will take place at Newclose on the Isle of Wight, starting on Monday 20 May. The home clash against the same opposition will see Welbeck host first-class cricket for the first time following successful 50-over fixtures at the venue since 2015. A trip to Tunbridge Wells to face Kent follows – and Nottinghamshire are scheduled to make the familiar outpost trip to Scarborough for a four-day game against Yorkshire starting on Sunday 18 August. The green and gold’s season will come to an end at the Kia Oval against Surrey, with the final round of Specsavers County Championship games set to commence on Monday 23 September. “The schedulers at the ECB have faced some pretty unique challenges in organising the fixtures for this year, with many international grounds being affected by hosting the World Cup,” said Director of Cricket Mick Newell. 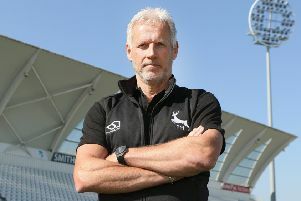 “The opportunity of hosting five games in the tournament is massive for Trent Bridge and for the local area. “We’re delighted to be hosting those matches, but it does mean there’s been some challenges with finding a balanced schedule. “Taking a four-day game to Welbeck is great reward for them having hosted us so well – and produced such terrific pitches – on the five occasions we’ve played one-day cricket there.